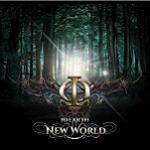 More information: "New World" is the 3rd studio album from UK band IOEARTH, contains over two hours of music across two discs and falls more into the Symphonic Progressive genre than their previous releases. Whilst having been on the road with IOEarth now for almost three years, vocalist Linda Odinsen makes her long-awaited first appearance on disc. The band have also added Jez King on Violin and CJ Jerromes on drums and percussion to the line-up. The album also includes a guest appearance by Zappa alum and extraordinary percussionist Ed Mann who is credited with performance as well as percussion arrangement for the track "Collision".